Perhaps this is what we were being shown at Woodway Bridge on August 24? Two sets of small bars for "3" or "4" along its outer border might mean "3 or 4 days" until Jupiter conjuncts with Venus on August 27-28. Likewise there are groups of “3 or 4 stars" just below a “crescent Moon”, which will be seen in Earth's night sky on the night of August 27-28. Get your cameras ready! You won't see this rare night-sky spectacle again until the year 2065. Our friend in a spaceship was watching Antares, Mars and Saturn line up in Earth’s night sky on August 24, 2016, which was a Mayan calendar date of 13.0.3.13.0. He can see us through the “glass windows” of his “mothership”, but will we see him soon? Some of the landscape imageries near this new crop picture at Woodway Bridge are both remarkable and instructive. We will show just a general description of the fallen crop picture here, along with one of its most interesting landscape imageries. Then we will discuss details of “star” or “planetary” patterns in the fallen crop on a later date, as well as another landscape imagery. Some people have interpreted this new crop picture as a “map of Earth as seen from space”. Yet an equally valid interpretation might be that of the “moving night sky” as seen from Earth, or from somewhere close to Earth in space? He is looking down at a series of “back-and-forth loops” which number “13” on top, or “13” below. Another symbol for “3” appears in a turkey-like image below and slightly to the left. We mention those landscape “numbers” here, because August 24, 2016 was a Mayan calendar date of 13.0.3.13.0 (see www.pauahtun.org). 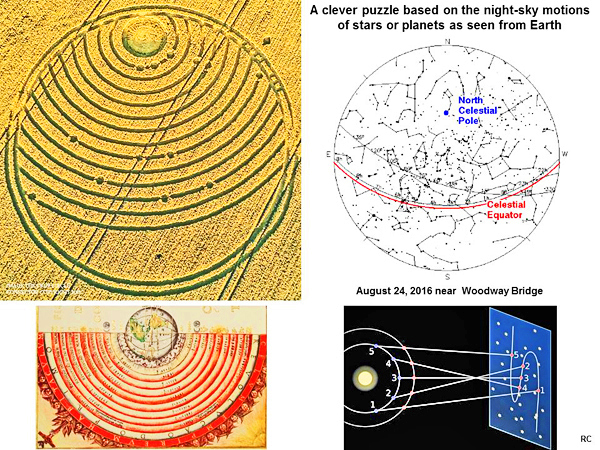 As for those “back-and-forth loops”, they resemble “loops of retrograde motion” in a Ptolemaic or Earth-centred solar system, which was the metaphor on which this Woodway Bridge crop picture was based (please see the first slide above). Planet Mars left its current loop of retrograde motion in Earth’s night sky on August 24, 2016, when it passed the bright red star Antares in Scorpio. That crop-drawn “eye” is “looking at” three large trees in the landscape on the left (circled in white at centre left). Those three trees match geometrically the Antares-Mars-Saturn night sky arrangement on August 24, 2016, which was drawn schematically in crops close to a “pupil” of this “eye”. 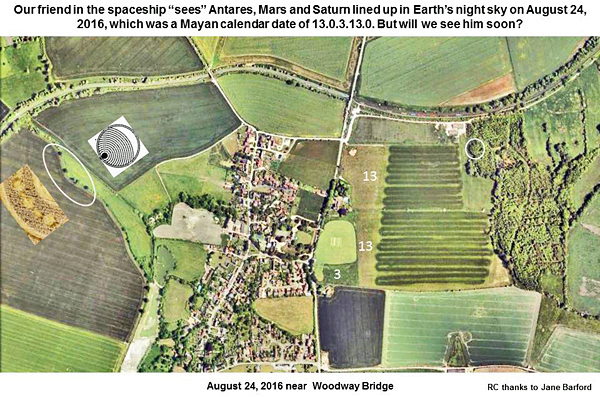 Part of an aerial field photograph was inset at centre left, to help illustrate how the three-body Antares-Mars-Saturn alignment was drawn in crops. 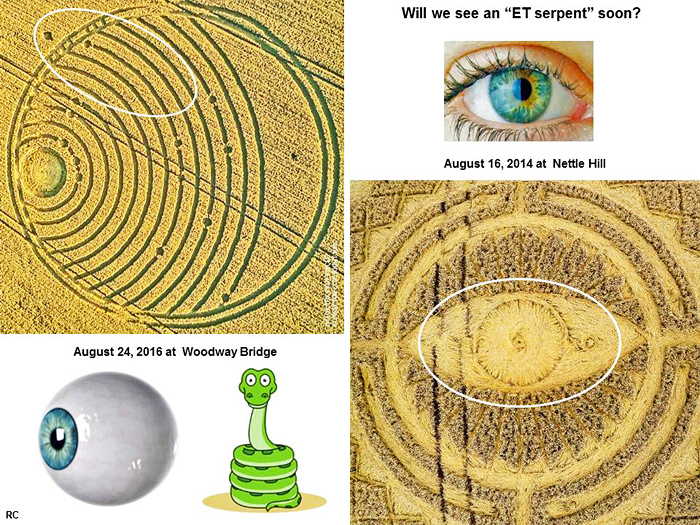 In summary, there seems to be no doubt, in a general sense, what the crop artist was trying to tell us! 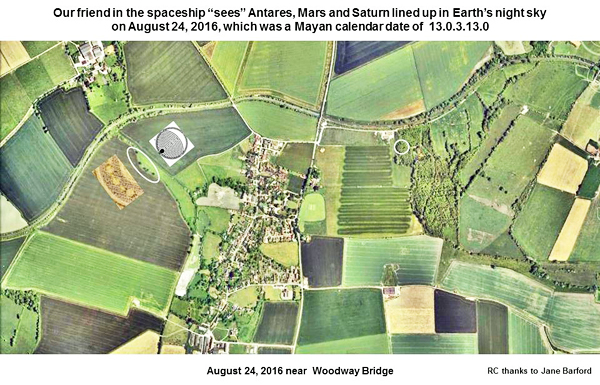 Our friend in a spaceship “saw” Antares, Mars and Saturn lined up in Earth’s night sky on August 24, 2016, which was a Mayan calendar date of 13.0.3.13.0. He can see us through the “glass windows” of his “mothership”, but will we see him soon? Our friend the crop artist seems to be in a spaceship somewhere near Earth, and was watching the Antares-Mars-Saturn sky alignment on August 24, 2016. That particular sky alignment has been noted in crops four times this summer (see wessex ridgeway articles). So what is the fuss all about? Our crop artist friend is clearly watching the stars or planets in Earth’s night sky. He implied on August 12 at Ansty that he was watching Earth through the “glass windows” of his “mothership” (see Ansty articles). Yet will we humans on Earth see him or his large spaceship soon? Perhaps! There will be another important night-sky alignment soon between Jupiter and Venus on August 27-28, 2016 (see venus-jupiter-nearly-touch-on-saturday). More than half of this Woodway Bridge crop picture remains unexplained. If we flip these same landscape images over by 180o (using Google Earth), then we can see an entirely different set of landscape imageries, which do suggest that we might see him soon. 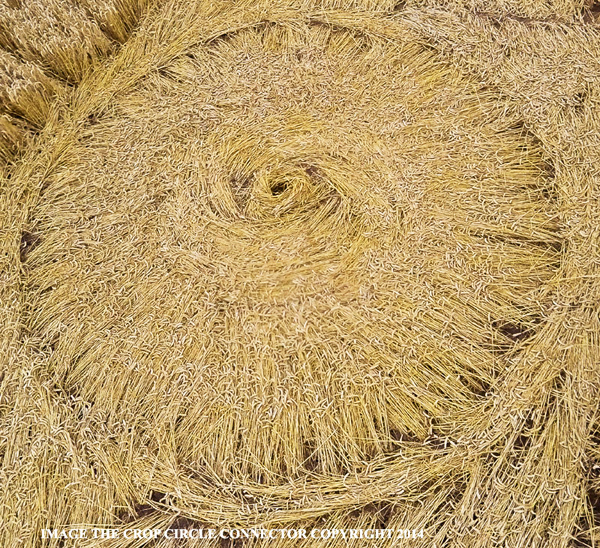 Detailed patterns within the fallen crop are very interesting, and will be discussed at a later date. A second set of “paired dots” within this patterned crop picture on curved arcs “3” or “4” (going away from its “pupil’ at “0”) may refer to Jupiter and Venus as a night-sky “pair” on Mayan calendar dates of 13.0.3.13.3 or 13.0.3.13.4, which match August 27-28, 2016 (see gregmaya). That Antares-Mars-Saturn “triplet of dots” was drawn in crops next to the “pupil 0” of this “eye”, or along curved arc “1”, consistent with Mayan calendar dates of 3.13.0 or 3.13.1, which match August 24 or 25, 2016 when those three sky objects were aligned. Two other sets of “small bars” along the outer border of this crop picture seem to read “3” or 4”, consistent with a “Mayan dating hypothesis” for the upcoming Jupiter-Venus conjunction on 3.13.3 or 3.13.4, or August 27 or 28, 2016 in our Western calendar. A small “fish” shape just outside of those “small bars” points to a large landscape “fish” just below, which has “13 stripes” in order to complete dates of “13.3” or “13.4” for a conjunction between Jupiter and Venus, beginning late on Saturday night August 27 and continuing into Sunday morning August 28. 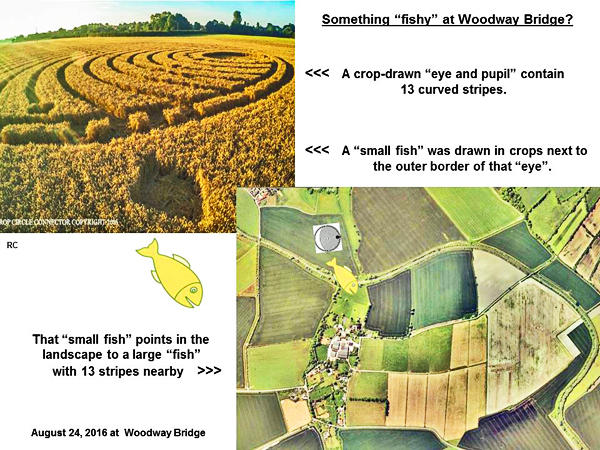 This brief analysis is therefore not intended to be a “last word” concerning the remarkable crop picture at Woodway Bridge, but only a firm place to get started. Meanwhile everyone should watch Jupiter and Venus form a close pair on Saturday night! Such a rare event will not happen again until the year 2065. 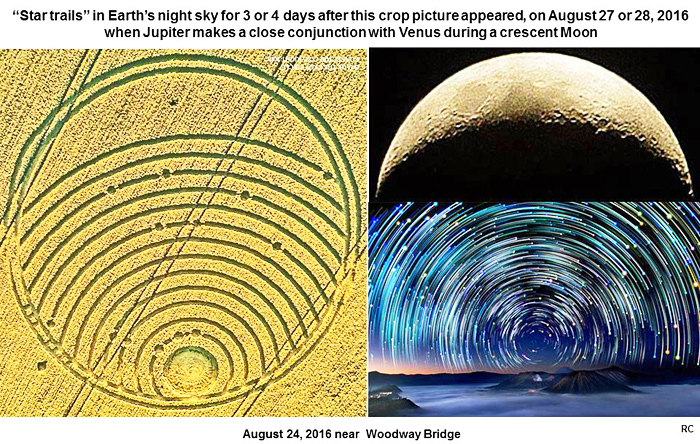 Further study of the Woodway Bridge crop picture confirms that its “lunar crescent and stars” motif, drawn there in crops, matches a night-sky date and time of August 27, 2016 at 2000 to 2200 UTC. This is exactly when Jupiter and Venus reach their closest conjunction with one another, elsewhere along the solar ecliptic. The Woodway Bridge. Wiltshire. Crop Formation of the 24th of August 2016. 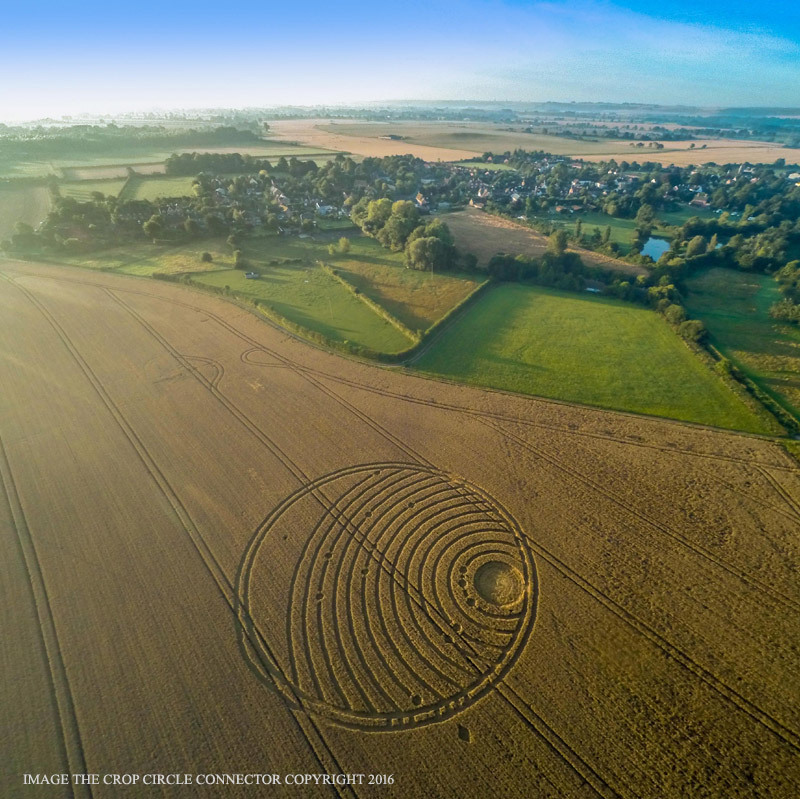 This is an extraordinary crop formation taking us into realms of modern science never before encountered or associated with the phenomena during its presence in our world. Many analysts have offered suggestions regarding its meaning. Some of which are very tentative, but others who have suggested probable astronomical explanations have been on the right track and maybe failed to resolve the puzzle only because the necessary knowledge and information was not to hand and also perhaps because they failed to recognize the clues carefully provided in the image by its makers. So what is it? 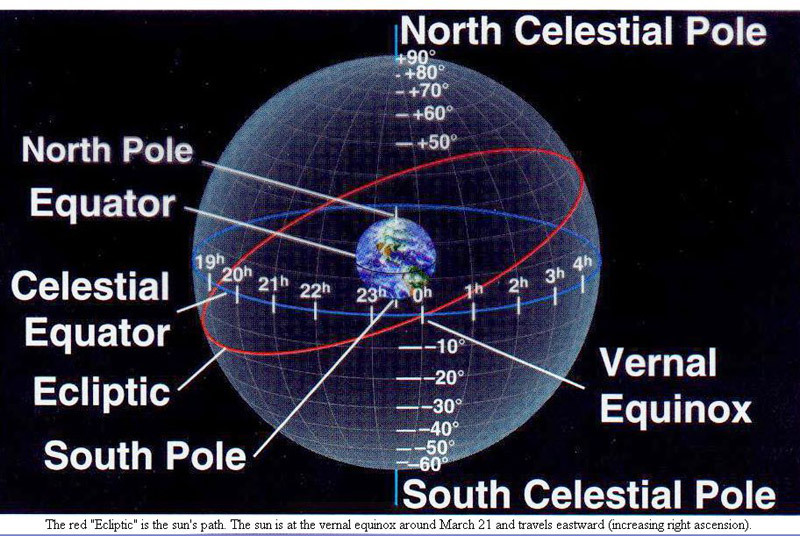 It is a representation of part of the Northern region of “The Celestial Sphere”. See illustration ot the concept below. Google search for more information. The sphere is an imaginary concept used by Astronomers and Astro- Navigators to precisely locate stellar and other sky objects on the internal surface of the imaginary hemispherical dome of the heavens, which we see when we look upwards. Every known sky object has its place on this imagined inner surface of the sphere and it can be referenced by a similar system to that of latitude and longitude we use on Earths surface. The graduated co-ordinates are identical. Declination is the name given to the equivalent of Latitude and its Zero is the Celestial Equator. Longitude Meridians are measured in RA. i.e., Right Ascension Hours, and its Zero is known as the Vernal Equinox, (see above,) or the “First Point of Aries”. Google search this latter heading for explanations of its use in Navigation. 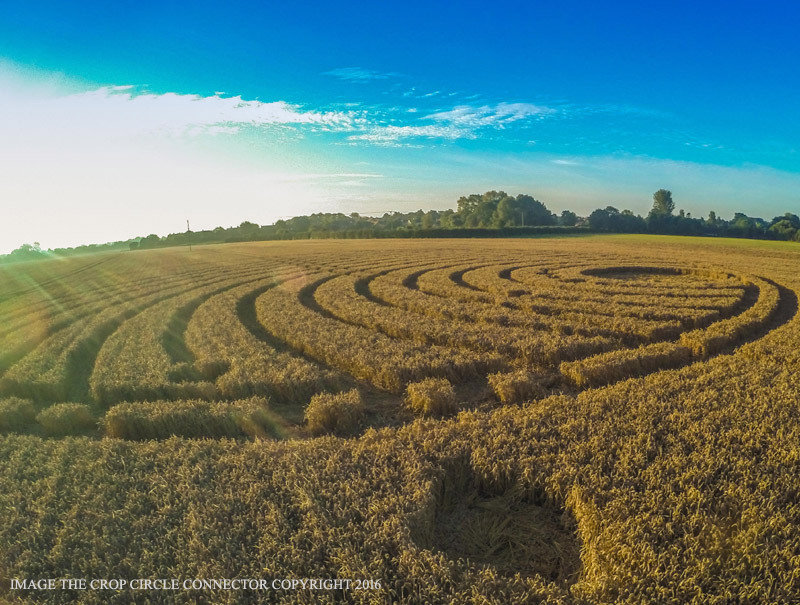 The Crop Circle view we see extends Southwards to a Declination of about +42 degrees from the NCP, ( North Celestial Pole) and the concentric Arcs are spaced each at a declination distance of approximately 3 Degrees. This measure is derived from the ‘printout’ (see below) of the region, obtained from my copy of the Planetarium Software “Redshift 5” ( Circa 2003,) marketed by Focus Multimedia Ltd. Given that the C.C. refers to the Celestial Sphere , we then have the question of what do the 13 disc like objects represent in their positions on the Declination lines? An obvious first choice answer would seem to be that they are significant Stars or maybe Galaxies or star clusters. But there are non of these objects which are all catalogued in Redshift 5’s data banks, which fit the patterns in the C.C.. A further search for ‘Quasars’ in the region brought up what seems certain to be the correct answer, The discs down to Declination 76Deg. 29 ms are a remarkable fit to the patterns in the C.C. The following are artists illustrations of typical forms of Quasars based on science’present knowledge. 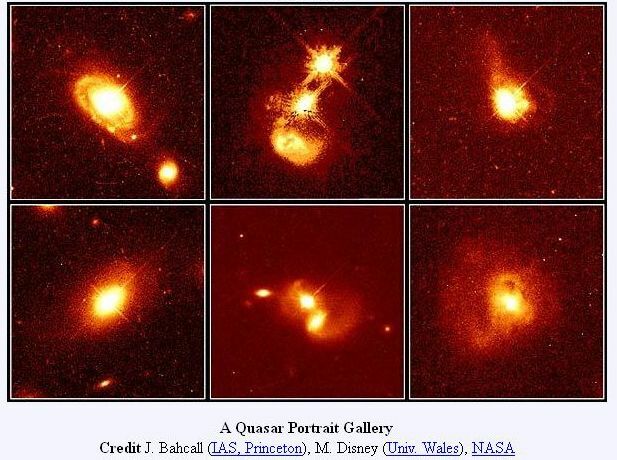 The following are actual photos of Quasars from The Hubble Space Telescope. They were first discovered as very remote radio sources by the users of giant radio telescopes in the early 1960s. They are not visible to the naked eye and cannot be seen in small telescopes. They are now believed to be very ancient Galaxies having a central Black Hole which is devouring star dust and debris to feed the ‘Jets’of immense energy projecting axially through their centres. The majority are now thought to be at least 12 billion miles away, on the edge of the known universe. There is at least one found to be over 20 billion miles distant, and the current 2016 tally for the total number of all types discovered is around 200,000. For exhaustive information on these fascinating mysterious objects, Google search the name and be sure to read the Wikipedia article on the subject together with the links to various Astronomical Groups currently engaged in ongoing discoveries. .
Getting back to the Woodway Bridge C.C. 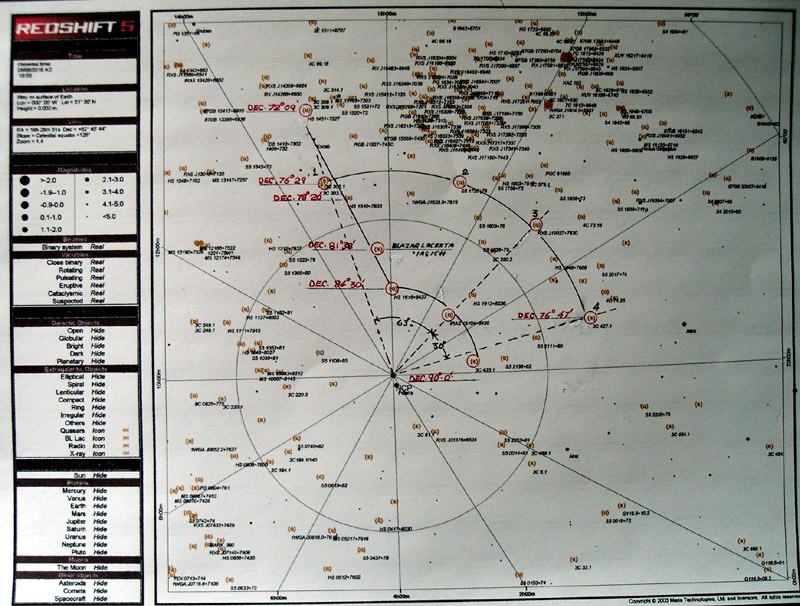 This is the Redshift 5 Printout of the NCP region’s 2003 population of Quasars. The red ringed ones match the disc patterns of those nearest 90 degrees declination. 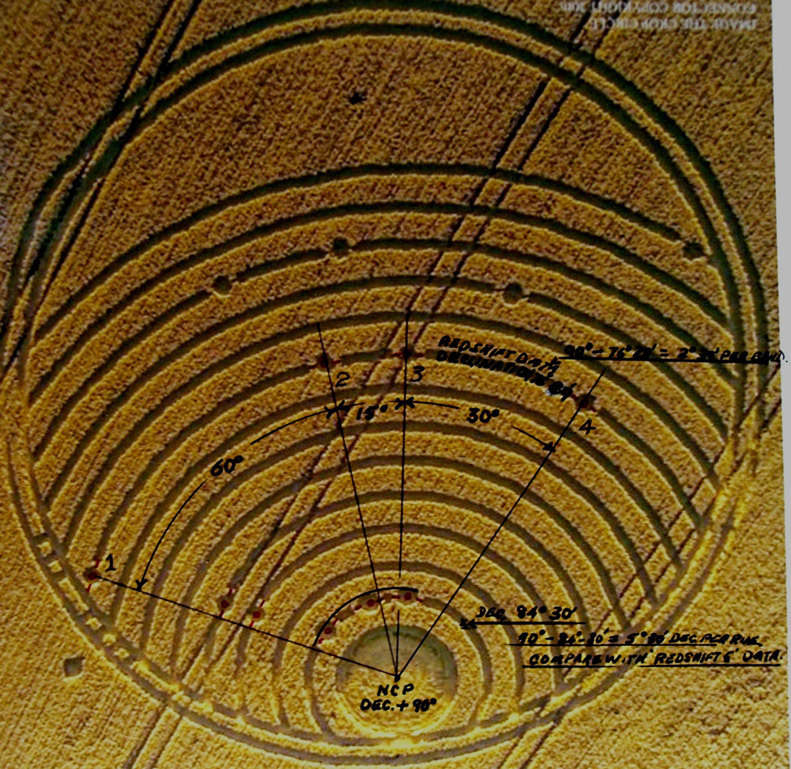 The illustration below is the CropCircle Connectors own aerial photograph annotated to show the close similarity of the disc pattern down to declination level 76degres 28 minutes. Note the deliberately isolated quasar symbol in the lower left hand (Northwest ) corner of the photo. The photo is inverted to align it with the orientation of the Redshift 5 Printout above. The field image gives us, ( with hindsight,) a clear and obvious clue to what the discs are meant to represent A close examination of the discs reveals that each of them is clearly separated from its carrier arc. They are symbols. Each has a short horizontal line cutting through its centre and protruding axially, somewhat like the symbol used by the London Underground system but with a whole disc rather than the red ring It has to be an icon for the outline of a Quasar. Look again at their typical outlines above. The mind behind this C.C tried to draw our attention to this disc detail by placing a single disc with it’s quasar like ‘Jets’, to the Northwest of the outer great C.C. circle. I missed it initially, did you? When you compare the aerial photo with the ‘Redshift 5’ Printout there are some differences in the positioning of some of the discs and also the angular distances, the RAs from the NCP centre.. 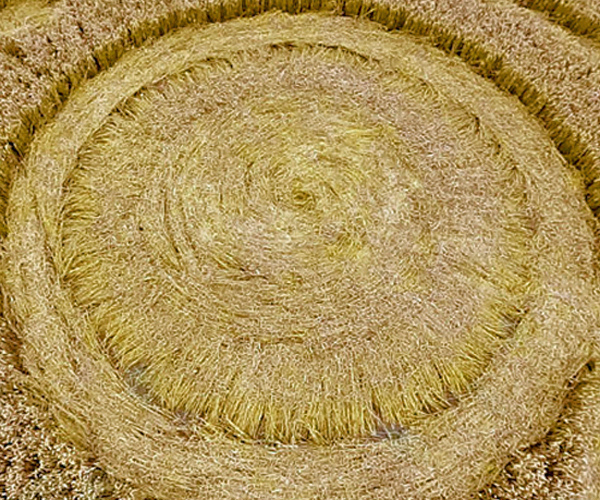 Some of this may be due to the fact that the field photo image is distorted .It is not truly circular. Also, while the Redshift Data is precise in it’s presentation of all the data , the makers of the C.C. are perhaps giving us a representation of the approximate Quasar patterns. They see no need for perfect precision in a field creation. What is intriguing though is that while we can see on the ‘Redshift 5’ data that there are dozens of quasars in the region, they have chosen to show a handful only, just thirteen. Why is this? My own theory is that the C.C. represents a deep space voyager’s equivalent of a ‘Sat.Nav’. Our GPS system employs multiple Earth satellites in stationary orbit and the ‘Tom Tom’ receiver in your car needs to receive transmissions from at least three of them to enable it to pinpoint your position on Earth. This system’s utility is restricted of course, exclusively to planet Earth .It is impossible for it to be used for navigation on any other body in the Solar System nor anywhere in space except within a very limited height of our immediate surrounding atmosphere. So how would a deep space navigator find his location when the maybe possible alternative system using the Celestial Sphere idea, shows him totally different group star patterns than those seen at his home base. This situation would come about because what we see from Earth and what pertains probably to all the inner regions of the Solar System, is a two dimensional sky picture of Constellations etc., whereas in reality, all sky objects are in a three dimensional environment. This means that perspectives and group relationships of stars he sees in his deep space travels will change continuously at a rate dependant on his vehicles velocity and direction. He will be unable to use fixed stars for positional fixes. However, assuming that the traveler has means to detect and identify a chosen group of the vastly remote Quasars, so remote that they will always appear to be on a two dimensional plane and therefore in permanently fixed positions, he will be able to triangulate his current deep space location using Sextant like instruments. Such positions will be recorded on “Quasar Nav.” screens”, perhaps in appearance like the Woodway Bridge C.C. and ‘Charts’ can then produced, enabling other spacecraft to repeatedly visit space locations of interest to their culture, such as our Solar System and its only known inhabited planet, “Earth”.